Is it possible to get the new additional line to flow onto the PO without manually sourcing it? I've read into the requisition change order process but all it mentions is 'changes' to existing lines that flow onto the dispatched PO, not 'adding lines'. I've managed to trigger the change order process by just changing an existing line, this creates a row in the PV_CHNG_RST_DTL table without any dramas and goes on to the PO. But when i ADD a line to the requisition no row is added to PV_CHNG_RST_DTL. I have created a Purchasing Requisition with one line and i have approved it. Now i created a PO and dispatched it. I want to make some chages in the line level for the Requisition and i want those changes to get reflected in My PO. FOr the above change to reflect in PO i ran the Process Change Order process unber Purchasing > Purchase Order> Manage Change Orders> Process Change Order. But the changes in the Requisition are not reflected in the PO. Can u please help me to solve this isseue? and if any setups that i have to use kindly let me know. 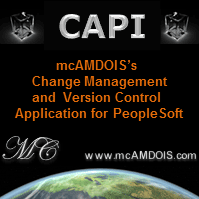 I would like to know if there is a Peoplesoft delivered process to handle Requisition Change Order .